The definition of "bang for the buck." Featuring high-brass cases, pre-fractured wads that maintain a reliable pattern and some of the best powders available. Fiocchi, .410 Gauge, 3 Shells, 11/16 oz., High Velocity Loads, 25 Rounds is rated 4.8 out of 5 by 40. 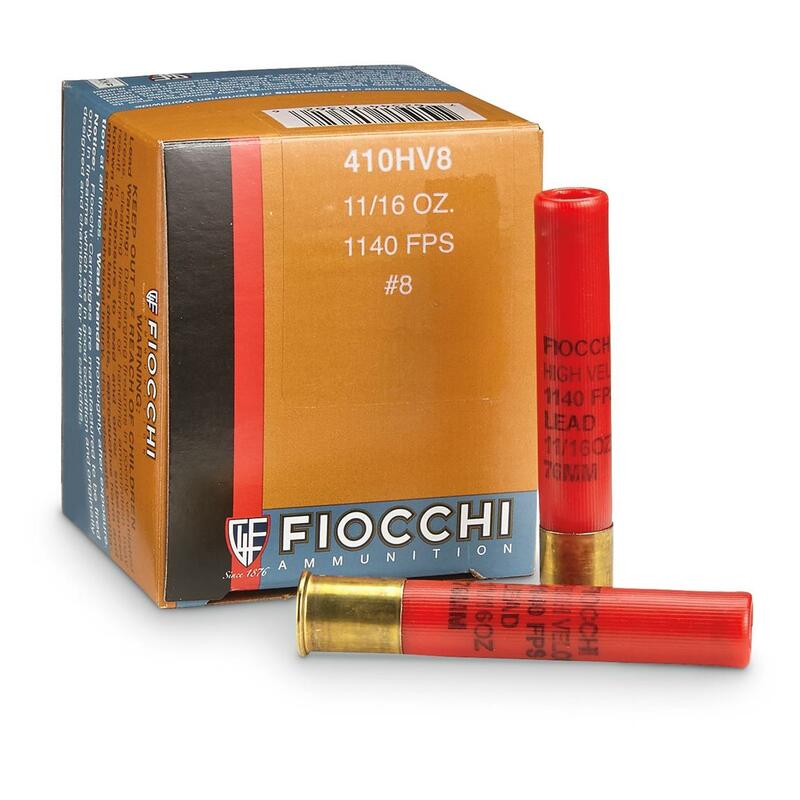 Rated 5 out of 5 by DavidValdina from .410 shells at a good price It's hard to find 3" .410 shells at a reasonable price, since there is little demand compared to the 12 & 20 ga. shell. Most stores, if they carry, will be charging $15 + for a box of 25. These Fiocchi are a great buy. Rated 5 out of 5 by Ed Upton from Performs great, will purchase more! Rated 3 out of 5 by Floyd R Turbo from Not the greatest quality I bought 6 boxes of this ammo, and at least 2 boxes of that was defective in as much as the shot had bulged out of the plastic sides of the shell far enough to keep it from fitting in either of my guns, thus rendering it useless. You can force it in there, but after you fire the round you need a screwdriver and a pair of pliers to get it out. These 2 boxes were scattered throughout the 6 boxes, so I had to check each shell individually before using it. I would not recommend this ammo to anyone.